(Late String Quartets:) "A powerfully intimate set which conveys the impression of four outstanding chamber musicians playing for each other - music-making eavesdropped upon, rather than projected to an imagined audience." (Opp 95 & 132:) "Though other performances may be technically more perfect, these are interpretations that come closer to the spirit of this great music than any other on CD. The Talich Quartet's reading brings a total dedication to this music: their performances are innocent of artifice and completely selfless. There's no attempt to impress with their own virtuosity or to draw attention to themselves. The recordings are eminently faithful and natural, not overbright but the effect is thoroughly pleasing." Quartet F-dur op. 59 #1 "Rasumovsky"
Quartet e-mol op. 59 #2 "Rasumovsky"
Quartet C-dur op. 59 #3 "Rasumovsky"
Download uit deze Rapidshare-folder of deze Mediafire-folder. 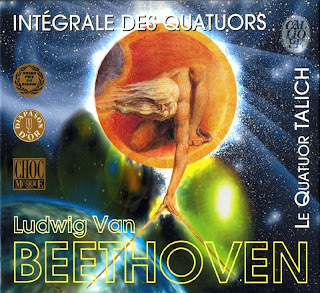 ¡Beethoven quartets integrale by Talich! Your contribution is one. Bedankt, keep up the good work! Reuze bedankt voor de upload. Ik copieer deze upload in Demonoid, met vermelding van bron, en met de originele "splurge", voor diegenen die niet Rapidshare gebruiken. Als je daar problemen mee hebt, zend me dan een message. Someone wrote me: "Nothing would make the program work until I finally rebooted today. Hi - I've been trying for a couple of days now to download disc III part 1, but whenever I do, Mediafire says: "No servers are available with the requested data on them." Is this their problem, or is there something you can do? In any case thanks very much for the other discs!! BTW, thanks our generous host! Rapidshare says: "There are not shared folders from this user." In Mediafire, the files are incomplete. Missing parts of Volumes II, III, V and VI. Very grateful for your generosity. The first phone that can undoubtedly create an amusing and entertaining way. And they are called as platforms among the regular players. fun with the game, it is downloaded. I would very much appreciate if you still can find the time and re-upload them.